Every new parent has a ton of "stuff" to cart around for you and your sweet babies-toys, sippy cups, books, keys, phones, drinks, snacks, diapers, etc. Insulated wipeable lining keeps bottles warm or cold. Zippered compartments keeps keys and phone safe and accessible. Bag attaches with Buckle straps to the handle bars so everything is at waist-height. The stroller organizer is made of high quality washer wrinkle fabric, which makes it durable and easy to clean. It is compatible with all single strollers: Bugaboo, Umbrella, Britax, Uppababy, BOB, Graco, Maclaren, Chicco, Baby Jogger, Stokke, Quinny, Orbit and more. You'll be happy to know that we've conducted numerous field tests to ensure our organizer perfectly fits different brands of strollers. Long straps can be joined to create a handy tote bag, or just easily use the specially designed strap to transform the organizer bag into a handbag that provides easy access to all of your necessities. 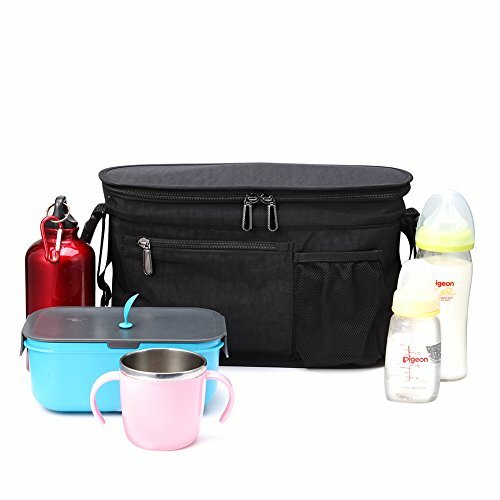 You can also use it as a backseat organizer and have convenient access to things you need when traveling with your baby by car. This versatile organizer is so much more than just a stroller bag! backed by a hassle free, lifetime and express replacement after-sales service. Black Stroller Organizer: Come with compartments which is easy and quickly to pick small items. When your baby is screaming for a bottle, quick and easy access is absolutely key while you are on the go.What's more,never miss a call with your phone in view. Insulated Cooler Bag: Insulated wipeable lining keeps bottles warm or cold. Attach Diapers Bag Perfect for Mom's On The Go!Design with buckle which is simple to install to the stroller handles or handlebars and adjust as necessary. Free Shoulder strap easily transforms the stroller bag to a shoulder bag to take on the go. Universal stroller organizer: Our umbrella stroller pram bag fit for Bugaboo, Stokke, Britax,Graco, Baby Jogger, Bumbleride, City Select, Chicco, Combi, CYBEX, Inglesina, Maclaren, phil&teds, Quinny, UPPAbaby VISTA and more. Free return within 30 days. If you are not 100% satisfied with the stroller organizer bag, simply return it for a full refund no questions asked.